The turmeric in our Lemon Chilli and Coriander marinade is not only good for you but also makes a delicious meal. This is simple and quick to cook, and requires only a few ingredients. Serve on its own, or add noodles. Pour 3 tbsp of Lemon Chilli over the chicken breasts, ensuring all the meat is coated. Leave to marinate in the fridge for 2-3 hours. Add 1 tbsp of coconut oil into a large frying pan, and melt using medium heat. Add the spring onions and cook for 2 minutes. Take off the heat and add 200ml of water and the peanut butter. Stir well. Add the spinach and stir. Return to the heat, continuously stiring until the spinach wilts. Remove from the heat. Add 3 tbsp Ginger Soy Marinade. Leave to rest. Melt the remaining 1 tbsp coconut oil over a high heat and add the marinated chicken, Stir fry for about 5-8 minutes until cooked. 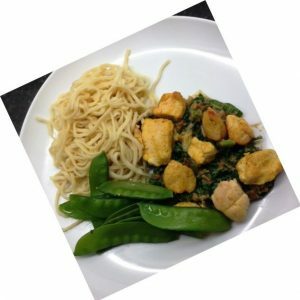 Warm the spinach satay and serve with the chicken. Adding noodles and mange tout if required.